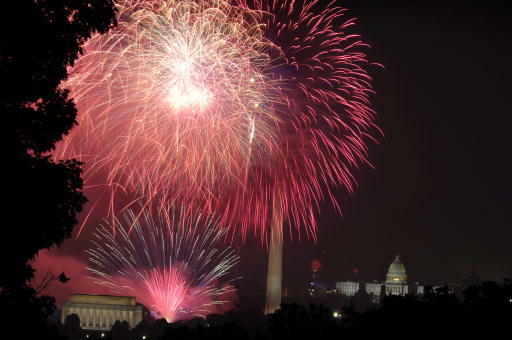 The National Mall in Washington, D.C., is lit by fireworks during a celebration of America's independence day. Courtesy the Defense Visual Information Directorate. The United States celebrates its Independence Day on July 4. The Fourth of July, or Independence Day, honors the nation's birthday -- the signing of the Declaration of Independence on July 4, 1776. It is a day of picnics and barbecues, patriotic parades, and a night of concerts and fireworks. The flying of the American flag is widespread. The history of our Independence Day celebration dates back to the 1770s, when the original 13 colonies were still under the rule of England's King George III. Although they had no representation in Parliament, they had to pay tax to England. For years, Congress sought unsuccessfully to resolve the dispute between England and the colonies. Finally, in 1776, the Second Continental Congress appointed a committee, headed by Thomas Jefferson, to draft a declaration of independence. On July 4, 1776, Congress officially adopted the document declaring their freedom from England. Although the signing of the Declaration was not complete until August, the Fourth of July has been accepted as the official anniversary of American independence. By the early 1800s the tradition of parades, picnics and fireworks was established as the way to celebrate America's birthday. The holiday was already widely observed throughout the nation when Congress declared it a federal holiday in 1870. Join the Signers the Declaration of Independence - Sign your name to the Declaration of Independence along side our forefathers. Celebrating the Fourth of July - By Marian I. Doyle. Reprinted courtesy of Early American Homes Magazine. Using Fireworks Safely - Fireworks safety tips from the National Safety Council.